All this time we've been working very hard and finally are able to share this super exciting piece of news - completely refreshed Marketplace plugin is ready to go! Not only design but also functionality have been changed. We've analyzed lots of different online shops and based on this research determined the most necessary features for your comfortable online shopping and selling and implemented them in our plugin. The functionality is so much better now that we've decided to remove the word "Simple" from the plugins name. Lots of new useful features, upgraded old ones and beautiful user-friendly interface - it's all about our refreshed Marketplace. Well let's take a look at the updates one at a time. You now can rate any listing from the marketplace. We've implemented a 5 star rating feature with an ability to leave comment about an item. You can filter the most rated products on the Browse Listings page. Also we've added a Most Rated widget, which you can edit in your Admin panel. You can rate sellers also! Just click Write Review button and a popup will appear on the screen. Leave your feedback and rate a seller with a necessary amount of stars. You can read these reviews on the Member Profile Page (Marketplace Reviews) or on the Marketplace Profile Page (Seller's Reviews). There's also Top Sellers widget where the most rated sellers are displayed. You can manage how many users will the widget display in your Admin panel. Admins can set Website fee and charge users for each successful deal. You can set charges fee in USD or %. It will be charged automatically during processing the payment. Users will be informed about the fee on Post New Listing page. One more brand new feature we've added is a Wishlist. If you like some item, but not ready to purchase it yet, just add it to Wishlist and decide later. Also we've added Add to Wishlist and Buy buttons on the Browse Listings page, so you don't have to go to products' profile pages one by one to buy them. Sell any types of goods! Nowadays Social Engine Market uses lots of things that can't really touch, it can be computer games, images, books, audio and video files and so on. You can sell such files using our Marketplace plugin! We've implemented a new feature in the plugin, that gives you an opportunity to choose product type while creating a new listing. Use Digital type for selling this kind of products. To sell other things choose Physical type. We used to sell Shipping module separately but now it is included into the Marketplace! So if you prefer to sell some Physical products, you can add shipping fee while creating the listing and easily send the item to the buyer. You can set Shipping fee option in your Admin panel. Coupons module is also now included into the Marketplace. You can create promo codes for your buyers, so that they can purchase some product with a discount. One more feature to please your buyers is Sales. You can create sales and assign them to some listing or to all of your listings. Those listings will be displayed with a "SALE" mark and and a "%" number on the photos and their prices will be adjusted according to the sale percent. Row/Grid view of listings on the Browse Listings Page for better visual appearance of the marketplace. Both Cart and Wishlist also have beautiful design now. Red indicator shows the number of items added to Wishlist and Cart. 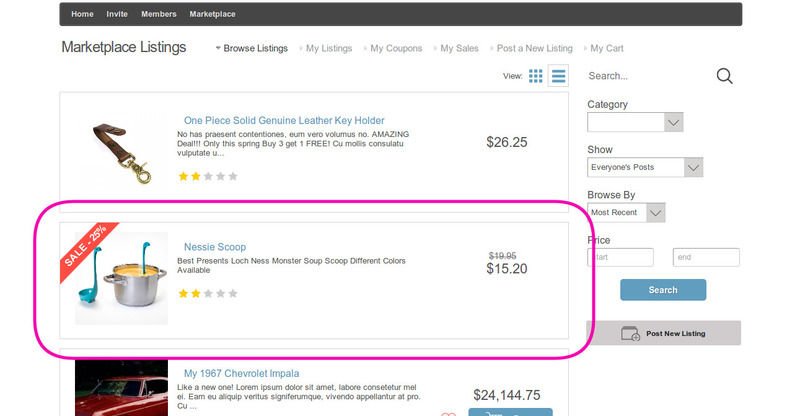 Use Cart popup to see what you have added to you cart or go to checkout right from the Browse Listings Page. Now you can make your listings more informative with the new visual editor we've added. Change font style, size and color, add links and much more! In a new version Custom Profile Types can be created for marketplace, with each profile type having different fields. Association of marketplace categories with profile types enables you to have different custom fields for each category of marketplace. New page in your Admin panel - Profile Types Mapping. On this page you can assign the categories with a Profile Type. Please, follow social engine plugins page to view more products. 6 Milestones of a Successful Online Shop Crowdfunding Day Special Offer!